Washington — The U.S. Environmental Protection Agency has rejected Connecticut’s petition to force a power plant in York County, Pa., to cut down on smog pollutants that the state claims heavily contribute to its unhealthy air. Officials claimed that computer modeling of emissions showed that nitrogen oxide pollution from the Brunner Island plant drifts into Connecticut, resulting in $135 million a year in health-care charges from asthma attacks linked to smog. While Connecticut lost on the Brunner Island power plant case, it may win other battles. It has joined with other states to battle EPA attempts to roll back Obama-era clean water standards and regulations on emissions from power plants, automobiles and trucks. To help support litigation, Connecticut has earmarked about $700,000 from the state’s $14.8 million share of the Volkswagen emissions fraud settlement to pay for certain costs, including the hiring of expert analyses the state can’t do on its own. Meanwhile, Connecticut environmentalists back a national “dump Pruitt” campaign promoted by more than 40 groups, hoping that his replacement would be more sympathetic to their cause. 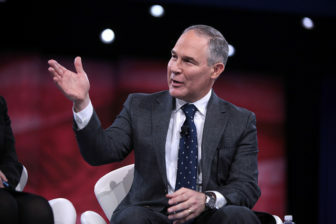 Roger Reynolds, chief legal director of the Connecticut Fund for the Environment, said former President Ronald Reagan initially selected an EPA head who was hostile to the agency’s mission, but replaced her after two years with someone who was sensitive to environmental concerns. Reagan’s first pick was Anne Gorsuch, mother of other of Supreme Court Justice Neil Gorsuch and a corporate lawyer who opposed the Clean Water Act and other environmental initiatives. Reagan then appointed William Ruckelshaus, who helped revitalize staff morale and bipartisan support for the EPA. Reynolds says the EPA can be saved if Trump does the same. 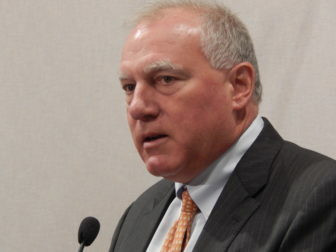 Flash points between the EPA and the state include a multi-state lawsuit joined by Connecticut Attorney General George Jepsen to force the EPA to address ozone pollution from certain upwind states – including Illinois, Pennsylvania and West Virginia — into Connecticut and New York. The state has also joined other states in opposing the EPA’s proposed repeal of the “Clean Power Plan,” an Obama-era program whose goal is to combat climate change by reducing carbon dioxide emissions from power plants in the United States by 32 percent below 2005 levels by the year 2030. Jepsen and other states have taken the EPA to court over its failure to establish regulations controlling the emission of methane, a dangerous greenhouse gas emitted by the oil and gas industry, in defense of the Waters of the United States Rule, an Obama-era initiative that expanded federal protections to thousands of waterways and wetlands. “The Clean Water Act is such an unmitigated success,” he said. Jamie Howland, director Acadia’s Climate & Energy Analysis (CLEAN) Center, said Connecticut’s participation in the Regional Greenhouse Gast Initiative, or RGGI, (a nearly decade-old carbon-trading agreement that limits greenhouse gas emissions from fossil fuel-fired power plants in New England, New York, Maryland, and Delaware) could shield the state from the impact of undoing the Clean Power Plant Act. 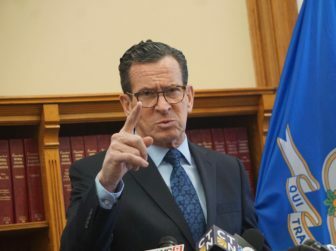 Theoretically, Connecticut should also be protected from Pruitt’s plans to ease more-stringent auto emission standards for cars and light trucks that were put in place at the end of the Obama administration. It is one of about a dozen states, after California, that are allowed to set up their own stricter-than-federal standards for motor vehicle emissions. “Cooperative federalism doesn’t mean that one state can dictate standards for the rest of the country,” he said. Jepsen has also joined a lawsuit, led by California, concerning the EPA’s plan for tailpipe emissions. Pruitt succeeds Regina “Gina” McCarthy as head of the EPA. They could not be further apart in background, temperament, or goals. Pruitt is former attorney general of Oklahoma who sued the EPA 14 times regarding the agency’s actions. McCarthy, who was the leading environmental official in Connecticut before becoming the official in charge of air quality at the EPA, then the agency’s administrator, worked for years on environmental issues, helping formulate RGGI and serving as environmental advisor for five Massachusetts governors. But Pruitt has become of lightning rod for criticism and is the target of a number of federal investigations. The Government Accountability Office found Pruitt violated federal law after spending $43,000 on a private phone booth intended to shield his meetings and conversations. Members of Congress are also questioning other Pruitt expenditures, including spending $120,000 of taxpayer money in two weeks of travel last June and his rental of a Capitol Hill apartment owned by the wife of an energy lobbyist for $50 a night. The EPA’s office of inspector general is investigating the rental arrangement. The House Oversight Committee is also exploring the EPA chief’s use of public funds for first-class travel. The White House Office of Management and Budget is investigating the phone booth. The EPA has also been hit by an onslaught of Freedom of Information Act (FOIA) litigation around Pruitt’s meetings, travel, and policy decisions. The latest flap is the EPA’s decision this week to bar press from a national summit on harmful water contaminants. The nation’s largest environmental groups have banded together in a campaign to oust Pruitt. “Pruitt is turning the EPA’s mission on its head. Instead of protecting the health of our families and environment, he’s pushing a full-on pro-polluter agenda, from stalling toxic chemical bans to attacking the Clean Water Rule to delaying clean air standards,” said the Natural Resources Defense Council in it’s “Fire Pruitt” petition drive. A number of other nonprofit outfits not usually known for environmental advocacy, including the National Association for the Advancement of Colored People, are also calling for the EPA administrator to resign or be fired. That decision rests with the White House and does not appear likely right now. “Scott is doing a great job!” Trump tweeted last month.